A small group of foreign dignitaries have arrived at the Pentagon, where they gather in a small conference room for a top-secret discussion. Russia’s Colonel Chekov is there, and attempts to convince one of the ambassadors that the cover story is true — a spaceship didn’t crash into the Pacific Ocean and explode a number of months before (“Descent”). The ambassadors aren’t buying it. But he no longer has to. General George Hammond and Major Paul Davis arrive to represent the United States, and to make full disclosure of the existence of the Stargate program. Davis begins the briefing by explaining to the ambassadors from China, Britain and France that the Stargate was discovered in Giza, Egypt, in 1928 (“Stargate” the Movie). It was activated once in 1945 (“The Torment of Tantalus” ), but that was a fluke — something the scientists were never able to duplicate. Seven years ago, the gate symbols were deciphered by Dr. Daniel Jackson, allowing regular gate travel. For the last six years, he reveals, the U.S. military has been operating a Stargate program out of Cheyenne Mountain in Colorado. Led by the flagship team SG-1, they have visited hundreds of worlds — and thousands more remain to be explored. The ambassadors are dumbfounded, and find the entire story quite hard to believe. But U.S. Senator Kinsey soon arrives to join the meeting, and insists that it is all true — though he himself has been opposed to the program in the past (“Politics”). The reason for the briefing is simple: despite SG-1’s thwarting of several alien attacks on Earth, the planet is now threatened by Anubis — the most powerful foe we have faced yet. The five nations represented at the meeting make up the bulk of Earth’s military capabilities, and only a coordinated, world-wide military effort could hope to stand up against another Goa’uld invasion. As the ambassadors begin to accept the veracity of the claims of the United States and Russia (which has known about the program for nearly three years), a new problem emerges: the Chinese ambassador is unconvinced that the Stargate should remain a secret. If Earth is to enter into a larger galactic community, the world must be prepared. He intends to recommend full disclosure to his government. The ambassadors also strongly object to the fact that the program is operated by the United States military, which has been reaping the benefits of alien technology acquired by gate travel. They demand that an international Stargate program be established, so that all may participate and share in the benefits. During a break, Colonel Chekov makes a private plea to the Chinese ambassador. Russia has been frustrated by the fact that they’ve been a “junior partner” in the Stargate program for years, but there are benefits that balance that out. It’s the U.S. that spends billions of dollars each year, and risks its own people exploring the galaxy to acquire advanced technologies. The program costs over $7 billion annually, and the U.S. has already spent over $2 billion on the X-303. Russia has already reaped technology from this. To resolve the conflict, Senator Kinsey plays his hand and makes a shocking proposal. He suggests that control of the program be turned over to a civilian organization that is already charged with oversight of alien technologies: the N.I.D. Hammond strenuously objects, stating that the N.I.D.’s bad track record (and rogue arm only recently shut down) speaks for itself. The men in control of the rogue arm of the agency even recently tried to kill Kinsey. During another break, Major Davis makes a few phone calls and learns the reason for Kinsey’s play: he’s recently had himself transferred from appropriations to intelligence oversight, giving him direct authority over the N.I.D. But as the ambassadors consider Kinsey’s proposal, General Hammond plays the ace up his sleeve. Supreme Commander Thor of the Asgard arrives in a flash, and the ambassadors are stunned to see a real alien sitting amongst them. Thor thanks General Hammond for the S.G.C.’s continual assistance of the Asgard, including SG-1’s recent efforts to help save their entire galaxy from the Replicators (“Unnatural Selection”). In return, the Asgard will outfit Prometheus (the X-303) with Asgard shields and weapons. Thor tells the ambassadors that, though their continued relations are not contingent upon it, it is “highly preferred” that General Hammond and his team at the S.G.C. continue to operate the Stargate program. And when Senator Kinsey tries to object to Thor, the Asgard quickly puts him in his place. It’s enough to convince the gathered dignitaries to support the S.G.C. “When Paul and I learned SG-1 would be doing a clip show in its sixth season, we lobbied hard and eventually won the opportunity to write it! Juuuust kidding. When we were first handed the assignment, we were less than enthusiastic. But, as we started writing, it became, if not exactly fun, then certainly interesting. 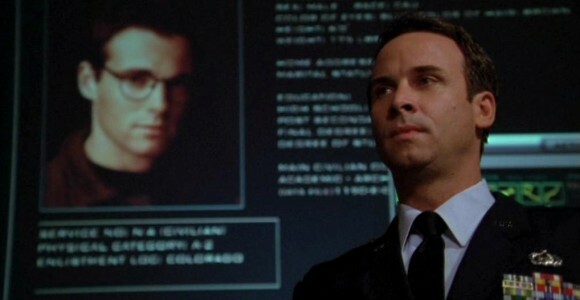 It’s Stargate 101 as the series deals with an issue that would plague it for years to come: How the hell can the government possibly keep the existence of the Stargate program a secret? VOTE! How would you rate SG-1's "Disclosure?"